The 2012 Mrs. Washington Pageant Contestants waiting for the Lip Sync Contest to begin. It was absolutely freezing that night! As you can see we are huddled close and wearing our coats. Making sure our beach balls are pumped up and full of air. Wow, look at the crowd behind me - this is the largest community event of the year for Moses Lake. The Amphitheater where we perform every year in front of thousands of people! Lisa Bluhm, Mrs. Washington 2011, speaking to the audience after being one of the judges for the evening. I just love this picture of our Director Pam Curnel and I doing the back stroke. We both love to dance! 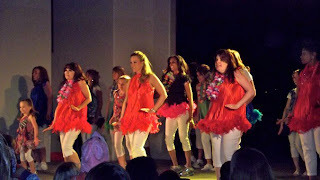 Our Director Pam Curnel made all of the costumes as well as choreographed the dance routine for this performance. She did a fantastic job in having us represent the 70's here. Watch out Tina Turner - Pam is in the house! Our Director Pam Curnel, myself, Pam's daughter Melissa, the Little Miss Washington Queens and the 2012 Mrs. Washington Pageant Contestants striking our end pose. The crowd went wild! A Royal Welcome! Memorial Day Weekend 2011 in Moses Lake. Well, it's that time of year for the reigning Queen to go back to Moses Lake (where she was crowned) for the annual Memorial Day Festivities to include the Lip Sync Contest Performance, Meet and Greet at McChosh Park and of course the Memorial Day Parade. As you can see, both Lisa Bluhm (Mrs. Washington 2011) and myself got a Royal Welcome from our wonderful Director as she opened up her home and turned it into a Resort just for us! We were spoiled with gifts galore! We are blessed! Since the state pageant was early this year, we got to both be apart of this fun weekend - honestly it was so much more meaningful to share this experience with my Queen sister rather than ride solo! 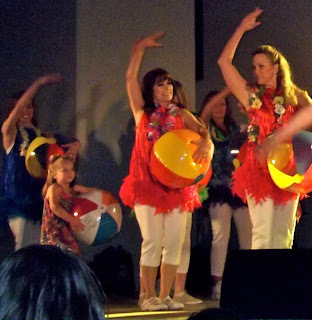 On May 22 we had our last dance rehearsal before our big Memorial Day Weekend performance in Moses Lake. A huge THANK YOU goes out to the Lakewood YMCA for sponsoring a place for us to practice! On April 23, the Mrs. Washington Pageant Family had a Welcome Home Party for our beautiful newly crowned Mrs. Washington 2011, Lisa Bluhm. She did a great job representing us at Mrs. America! We are so proud of our Queen! After the party, we then had to get back to work to rehearsing for our upcoming dance performance to be held at the Annual Moses Lake Lip Sync Contest during Memorial Weekend. While our Mrs. Washington 2011 - Lisa Bluhm - was representing us at Mrs. America we still had work to do at home. Above is a picture of some of the current Mrs. Washington 2012 contestants and I practicing for the upcoming Lip Sync Contest held in Moses Lake during Memorial Weekend. On Friday, April 29th I had the honor of being "Vanna White" for the anuual Idlewild Elementary School Auction Roundup. It was so great to come back as Mrs. Washington 2010 this year! With our beautiful Emcee Holly Bocchi (a.k.a. Jesse!) getting ready to auction of " Miss Idlewild 2011"! This is always a popular item to bid on as Mrs. Washington herself comes to Idlewild School in person to crown the lucky girl. Also included is a pizza party, bingo and prizes for her classmates as well! This year the winner will have both Mrs. Washington 2010 (myself) and Mrs. Washington 2011 (Lisa Bluhm) come to crown her Miss Idlewild 2011! Tempting the audience with a scrumptious dessert! With my faithful friend and fellow Cub Scout Leader Jane Starr! With another dear friend and fellow PTA mom Darlene! On Friday, April 29th I had the pleasure of visiting Lakeview Hope Academy during their school awards assembly. My son Cody and I with Lakeview Hope Academy's Principal Michael Auton. During the school assembly I had the opportunity to share my platform "Embracing the Special Needs Child" along with promoting Music Education.